The TIM-R is a tool for teacher reflection on a lesson. It was added to the TIM Tools suite at the request of client districts. Many districts were using the TIM-O as a tool for teachers to reflect upon their own lesson in addition to an observation tool. They found this to be a very valuable exercise for teachers, but in earlier versions of TIM Tools, doing so required making every teacher in the district an observer so that they could observe themselves. In addition to the inconvenience of making every teacher in the district an observer, the use of the TIM-O for reflection resulted in a TIM-O database where observations and reflections were intermixed. 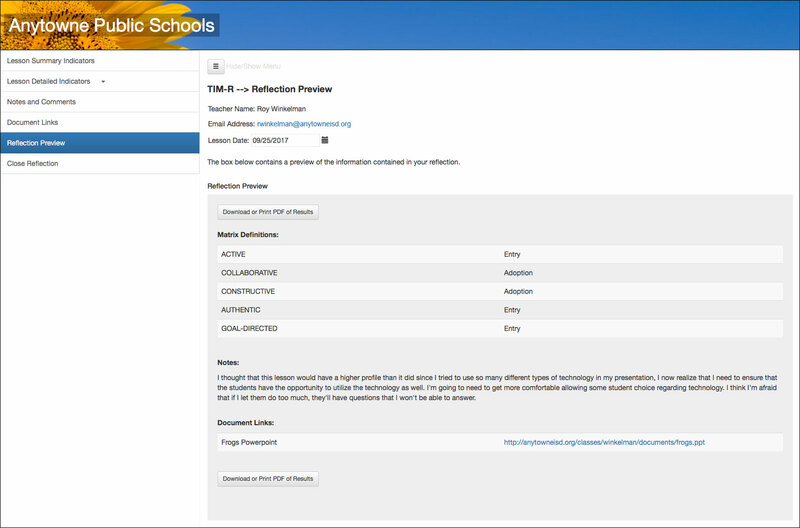 Districts can now use the TIM-R for teacher lesson reflection and not have reflection data intermixed with actual observation data when they generate reports. The TIM-O and TIM-R can be used in conjunction with each other. For example, an observer might request that teachers to complete a TIM-R reflection on the same lessons in which they were observed. The observation profile and comments can be compared with the reflection profile and comments in a follow-up conference as a starting point for a conversation about the lesson. To begin a reflection, from the Main Menu select My Reflection Tool (TIM-R). The TIM-R opens to the Dashboard screen. Figure 1. The TIM-R Dashboard. There are two previous reflections by this teacher. From the Dashboard, a teacher can begin a new reflection; edit, delete, or toggle the publication state of previous reflections, edit the teacher’s My TIM-R Notes, or download a spreadsheet of previous reflections. To begin a new reflection, click New Reflection in the TIM-R menu. The new reflection opens in a new tab and first gives the teacher the choice of a Question-based or a Matrix-based reflection. Figure 2. Choosing between a question-based reflection and a matrix-based reflection. A teacher choosing the Question-based method, will be asked the same series of branching questions about the lesson as is included in a regular TIM-O observation. A teacher choosing the Matrix-based method will be taken directly to a Matrix allowing the direct selection of levels for each of the five characteristics. When the TIM profile is complete using either method, the teacher can select Notes and Comments from the TIM-R menu to add a personal reflection to the report. Figure 3. Any text entered into the “Comments for Report” field will be included in the published report. Any text entered into “My Notes on this Reflection” will be visible only to the teacher. Teachers can add links to supporting artifacts on the Document Links screen. Any number of documents can be linked. Figure 4. Adding Document Links to a reflection. Reflections can be previewed from the Reflection Preview screen. A Download or Print PDF of Results button is available for the preview. Figure 5. Previewing a teacher reflection. If the teacher is satisfied with the preview, the Close Reflection button should be clicked to close the tab and return to the Dashboard. The new reflection will appear on the list of previous reflections with its publication status set to Not Published. The reflection will not be available to administrators or be included in reports until its status is changed to Published. Any reflection on the list can be edited, deleted, or have its publication status toggled between Not Published and Published. Teachers may use the My TIM-R Notes field to record questions about the lesson they wish to discuss with their coaches, set personal goals, record strategies they plan to try in the future, or any other notes to self. These notes are accessible only to the teacher and are not included in any reporting. Teachers may also select the Download Spreadsheet option to receive an Excel file of all their published reflections.